A pond can help with water for livestock, fire protection, erosion control, aquaculture and more. Both practical and idyllic, farm ponds are a dream for many newbie farmers. Clear, clean water surrounded by lush grasses and perhaps a weeping willow tree may be the image that first comes to mind, but achieving that dream is often a costly and complex affair, if possible at all. But you’ll know if it’s feasible if you understand the lay of your land, the way water moves through it and the basic requirements for building a pond. There is much more to building a pond than digging a hole and letting it fill. If you don’t have a background in engineering, you’re going to need outside help to make it happen. There are serious legal liabilities involved in dam construction (i.e. if it breaks) and you may have a mountain of red tape to climb in order to get a permit, depending on the size and location of the pond you want to build. Many rural landowners don’t realize that they don’t own the water that flows across their property. The vast majority of lakes, wetlands, rivers and streams – all the way down to the tiniest tributaries that you could leap across in a single bound – are, from a legal perspective, considered Waters of the United States. Doing anything that impacts these waters requires permission from the EPA under the Clean Water Act. Any water that is not covered under federal jurisdiction is often covered under state laws. In California, every drop of water is regulated, whether it’s in Lake Tahoe, a puddle on the streets of Los Angeles or in an aquifer beneath the Central Valley. Ponds for legitimate agricultural purposes – irrigation or watering livestock, for instance – are exempt from most permitting requirements. However, you will still have to file for the exemption, which may involve quite a bit of bureaucracy itself. If you just want a pond to swim in, you’ll probably need a permit, which is granted at the discretion of the environmental protection division in each state (the state-level enforcement arms of the EPA). The farther away the pond is from a year-round stream, the easier it will be to obtain a permit. 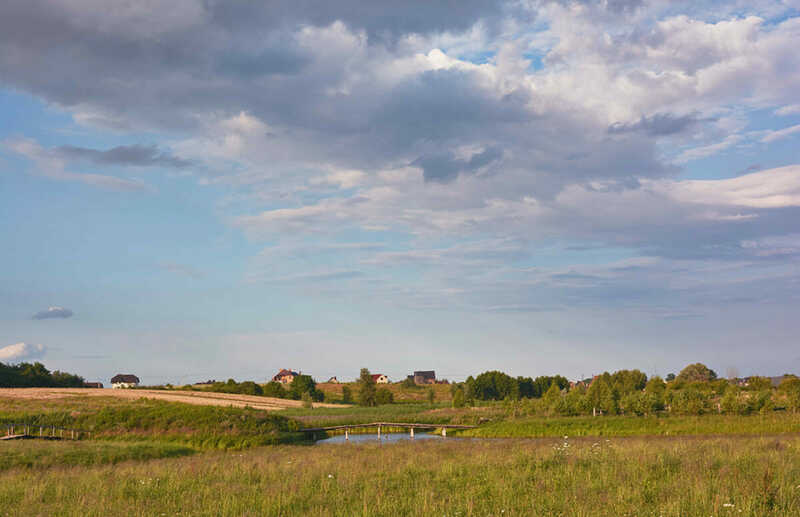 Before you get carried away with grand visions of a farm pond, consult with your local Natural Resource Conservation Service (NRCS) office to find out about the regulations that pertain to your property. The NRCS is a branch of the USDA charged with helping landowners conserve soil and water resources and can advise you on whether or not you need a permit and, if so, which agency you need to apply to. They provide free technical assistance – and sometimes financial subsidies – for building ponds. In places that lack summer rainfall, like much of the Western U.S., ponds fed only by surface runoff slowly dry up over the course of the summer. They are also prone to being cloudy because of the soil particles contained in the runoff. Groundwater. On its own, groundwater is usually not sufficient as the sole source of water for a pond, but it can make a significant contribution to ponds fed by surface runoff, meaning a smaller drainage area is required. The most groundwater is available in low-lying areas with a high water table. However, moderate slopes with wet soils (seepages) are an ideal place to build a pond. Springs. Springs occur where seepages have sufficient volume to come above ground in a continuous flow. Spring-fed ponds may not require any surface runoff to keep them full, meaning they will be clear, clean and cold. Using spring water to fill your pond may trigger permit requirements in some locations, but it is the ideal source of water for a farm pond. Streams. It is very difficult to get a permit for building a pond directly in a stream (there are important environmental reasons for this). More often, a portion of streamflow can be diverted to help fill a pond in an adjacent area. Wells. You can pump well water to fill a pond, though the electricity to do so is costly unless your pump is solar-powered. Well water is generally considered a practical source only for small ponds, or to top off large ponds during dry spells. Most farm ponds are constructed in a drainage basin on gently sloping terrain. The earth that is excavated for the pond basin is used to construct the dam. However, there must be sufficient clay content in the soil for the pond to hold water – 20 percent clay content is the recommended minimum. Collect soil samples from several holes in the vicinity of the pond site. Make sure to dig beneath the dark black topsoil and collect your samples from the subsoil. Mix a handful of soil from each hole in a quart-size Mason jar. Fill the jar with water to within 2 inches of the top and shake vigorously for about 60 seconds. Set the jar on a table where it can remain undisturbed for 24 hours and observe the soil particles as they collect on the bottom. Sand particles will immediately fall to the bottom of the jar, followed by silt particles (which are slightly smaller and lighter than sand particles) that will collect on top of the sand over the next few minutes. The clay particles, which are exponentially smaller than either sand or silt, will slowly form a layer on top of the silt over a 24-hour period. Once the water is clear, use a ruler to measure the thickness of the three distinct layers at the bottom of the jar and calculate the relative percentage of each. If your soil does not have sufficient clay, you can import heavy clay from a landscape supply company and spread it over the bottom of the pond and the inside of the dam to prevent the pond from leaking. Rubber pond liners are another option, though they are extremely expensive for all but the smallest ponds. If your pond requires a permit, the local regulatory agency will likely require an engineer to design it. If no permit is required, there are expert pond builders in most rural areas that are qualified to design and build a basic farm pond. After you do your homework to determine practicalities of building a pond on your land, reach out to your neighbors for references on local pond builders. Make sure they have adequate liability insurance and are experienced in building ponds for the particular purpose you have in mind.